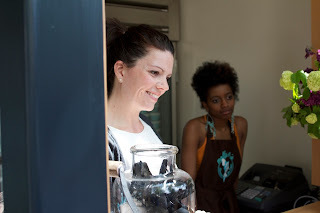 molly moon's homemade blog: Molly Moon's Madrona Set to Re-Open May 1! Molly Moon's Madrona Set to Re-Open May 1! 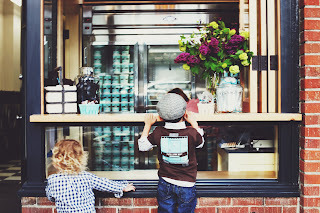 The Molly Moon's seasonal pop-up shop located at 1408 34th Ave in Madrona is slated to re-open Tuesday, May 1! Madrona residents are sure to be delighted as this mini Molly Moon's has undergone a mini renovation. We've added an ice cream dipping cabinet and will offer five flavors available for scoops in cups and house-made waffle cones! Sundaes, milkshakes, hand-packed pints and Molly Moon's signature ice cream sandwiches are also featured on the menu at Molly Moon's Madrona, which will be open daily from 12-noon to 10 p.m.
Molly Moon Neitzel's first cookbook, Molly Moon's Homemade Ice Cream: Sweet Seasonal Recipes for Ice Cream, Sorbets and Toppings Made with Local Ingredients, is arriving early! 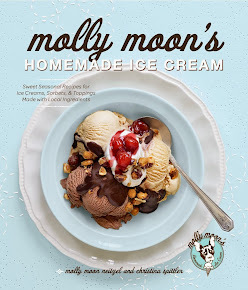 Ice cream lovers and Molly Moon's fans alike will find this lovely cookbook, inspired by Neitzel's childhood memories and Washington's bountiful harvests, in all 135 Anthropologie retail locations and online on Friday, April 20! Seattle-based Sur la Table will also carry Molly Moon's in each of its 90 gourmet kitchen shops. Stay tuned for news on Neitzel's "Parade of Flavors" book tour and official book release party! Springtime strawberries have invaded Molly Moon's! Strawberry Pink Peppercorn ice cream and Strawberry Rhubarb sorbet, both made from local Remlinger Farms' berries, are headlining our shops' seasonal menus! The Molly Moon's website was recently revamped and allows visitors the opportunity to learn more about our ingredient sourcing via the interactive Molly Moon's Trade Map! #HotFudgeHappyHour is happening at @mollymoon Wallingford, Capitol Hill and Queen Anne locations from 3-5 p.m. throughout the month of March! Free hot fudge on all scoops! Please come to Nashville on your book tour! Thank you for kind words Elizabeth! So glad to hear there's love for Molly Moon's in Nashville! Any plans for opening locations on the eastside? It would absolutely rock to have you in Bellevue! While, I find it worth the drive into town, unfortunately most of my friends are not ready to deal with parking tickets as often as I do just to get a scoop of earl grey. The lack of parking at your Capitol Hill and Wallingford locations is seriously discouraging.